Shark Week – Tons of Fun for Everyone! Join STINAPA for a week filled with shark fun from Sunday June 19th – Saturday June 25th. STINAPA, along with the other Dutch Caribbean islands and Holland, is inviting the community to celebrate Shark Week. The Save Our Sharks project is an initiative of the Dutch Caribbean Nature Alliance and is made possible by the ‘Nationale Postcode Loterij’. Due to intense overfishing, shark populations throughout the world are in trouble. 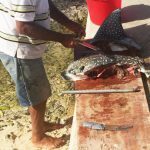 The Save Our Sharks campaign is focused on creating awareness in the Bonairean community, working with fishermen and conducting research on sharks. Sunday June 19th from 3pm to 7.30pm – Launch of the Bonaire Shark Week at the Kas di Regatta with the Bonaire Sailing School. There will be sailing activities, shark games & crafts, and plenty of information about Bonaire’s sharks. Monday June 20th to Friday June 24th from 2.30pm-3.30pm. Shark presentations at the Sentro di Bario’s afterschool program together with the Mediabus each weekday.On Monday in Rincon, Tuesday in Antriol, Wednesday in Nort Salina, Thursday in Amboina, Friday in Nikiboko. Tuesday June 21st 8pm at the Empire Cinema– The premiere of the movie Great White Shark 3D. This is the first showing of this fantastic movie in the entire Kingdom of the Netherlands. Tickets are $7.50. Great White Shark 3D will also be shown Wednesday and Thursday evenings and the following week Monday through Thursday also. Don’t miss your chance to see this beautiful 3D film! Wednesday June 22nd presentation from 7pm to 8pm at CIEE Research: The Strange Lives of Sharks. Thursday June 23rd from 8pm to 9pm at Little Havana – Shark Trivia Night. Join us for a shark trivia quiz – prizes for the winners! -From 6pm to 10pm: The ‘Shark Art Extravaganza’ at Wilhelmina Plein during the Taste of Bonaire. The shark art competition winners will be announced and prizes will be awarded at 7pm. There will also be games for kids, music, face painting & a whole lot more. We will be next to the Time Capsule and El Mundo restaurant. STINAPA invites the entire Bonaire community to join us at one or all the activities during this week. 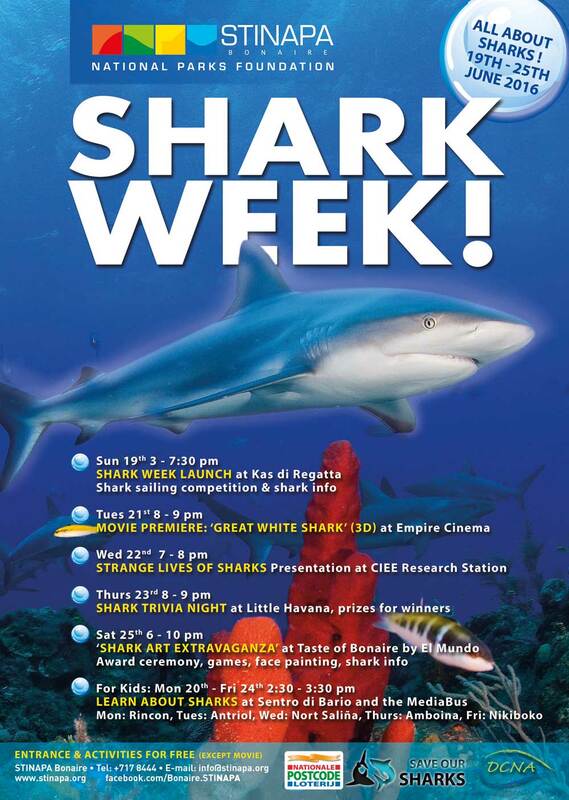 All Shark Week events are open to the public and free of charge EXCEPT the Great White Shark 3D movie at Empire Cinema for the special price of $7.50. Coral is climate. Coral is work. Coral is biodiversity.